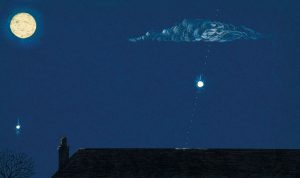 Painting of a UFO spotted on 18 January 1975, near Birmingham. 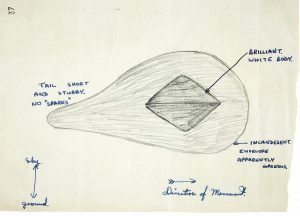 Later identified as satellites Zond 4 and Cosmos 460. 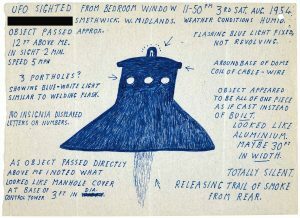 Sketch of a UFO seen from Stourport-on-Severn, Worcestershire, 25 April, 1969. 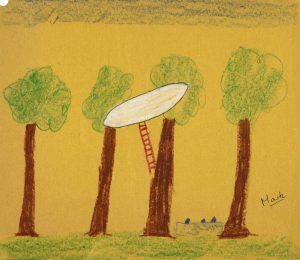 One of a group of drawings of a UFO seen by school children at Upton Priory Junior School, in Macclesfield, October 1977. 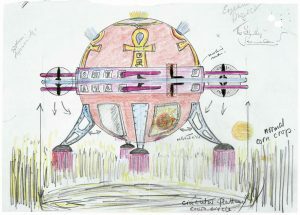 Drawing of a UFO producing a crop circle, November 1998. 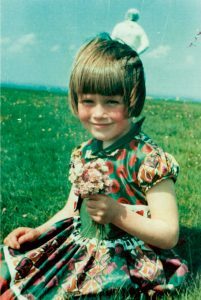 Photograph taken by Jim Templeton of his five-year-old daughter Elizabeth in 1964. Templeton and his family saw nothing unusual at the time of the photo, as they enjoyed the wild scenery of northern Cumbria in the UK. But when he collected the processed film the shop assistant said: “That’s a marvelous photograph, but it’s rather spoilt by the big man behind her!” Taking a closer look, Templeton was amazed to find that on one of the prints, standing just behind his daughter’s head, was a large figure dressed like an astronaut in a white suit with a dark visor. 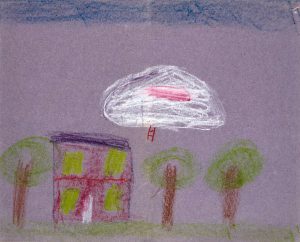 Left: One of a group of drawings of a UFO seen by school children at Upton Priory Junior School, in Macclesfield, October 1977. 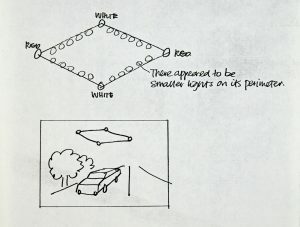 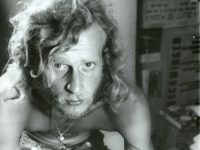 Right: UFO seen in North Yorkshire, 15 October 15, 1981.